Arrrr....a Pirate Sensory Bin just in time for Talk like a Pirate Day me hearties! 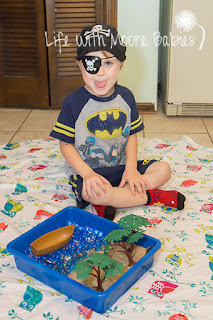 When I decided to make a pirate sensory bin I kept coming back to pirate booty. Pirates are known for their booty, so I wanted to be sure to incorporate some without it being the entire bin. Instead I chose to create a beach effect with sand and water beads. 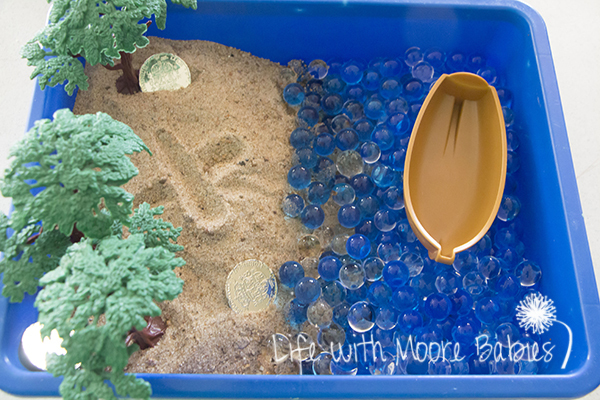 I added the sand first and then filled the other half with blue and clear water beads. I added a couple trees, gold coins, and a little boat to finish it out. 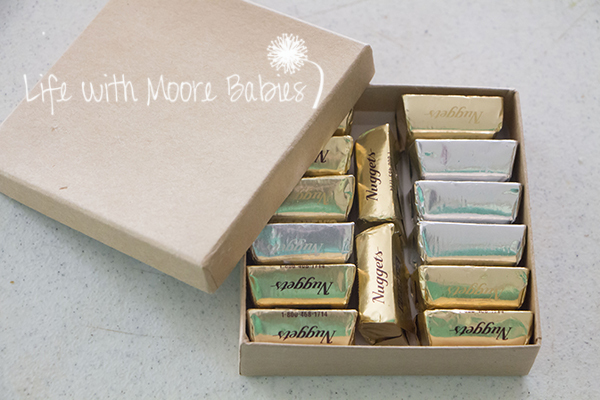 In the sand I buried a little box full of gold (Hershey's) nuggets, so the bin become a miniature treasure hunt! I even drew an "X" over where I buried it to give the kids a hint! 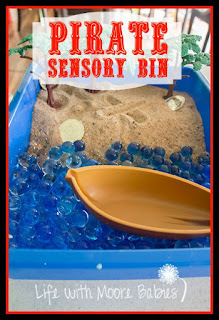 Although my kids refused to talk like a pirate for me, they did don pirate gear to play with this sensory bin! 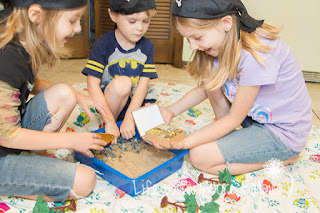 I was amazed that they didn't immediately dig under the "X" in the sand! Everyone knows "X" marks the spot. Apparently everyone except my kids! Instead they thought it was great fun to sink the boat in water beads and flood the shore! Finally they happened upon the box! They were thrilled with the booty they found! Of course it had to be abandoned until they were finished playing. At this point it become more about sensory play then pirate play as they rolled water beads in sand and tried to build with the now damp sand. 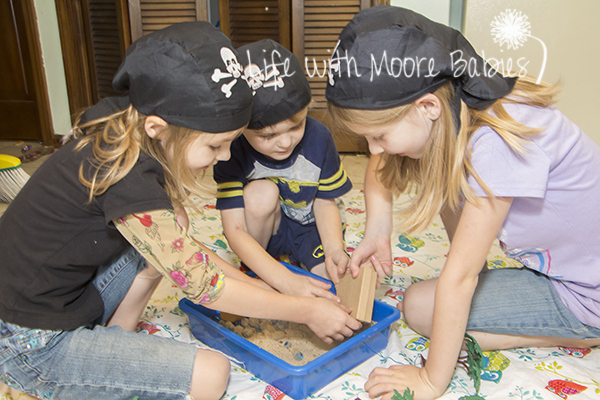 Eventually their newly found treasure won out! 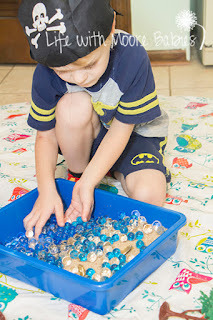 Cleaning the floor was simple since we put down a tablecloth; I was most worried about getting the sand off the water beads! Luckily the water beads separated from the sand easily in water! 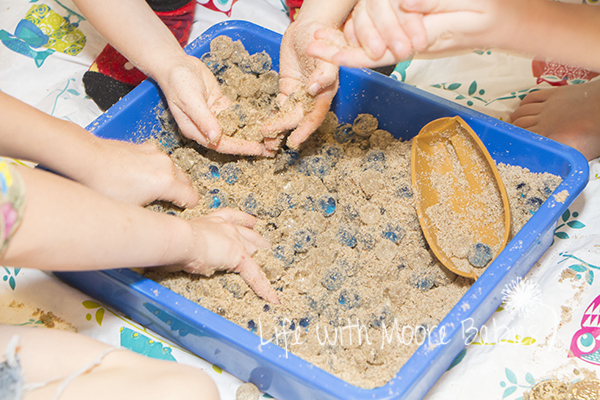 After clean up everyone happily sampled some gold nuggets; even me! 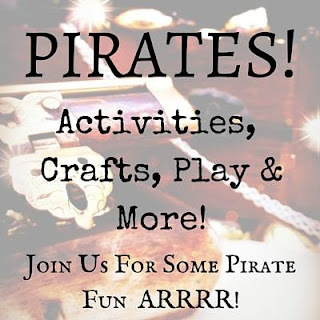 Be sure to check out all the pirate fun in our Pirates Blog Hop on the following blogs! Head over to Peakle Pie to check out even more pirate fun or add your own to the linky party!